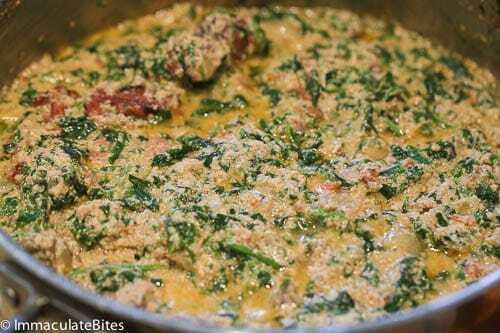 Quick , easy and healthier Egusi soup, made with lots of spinach. 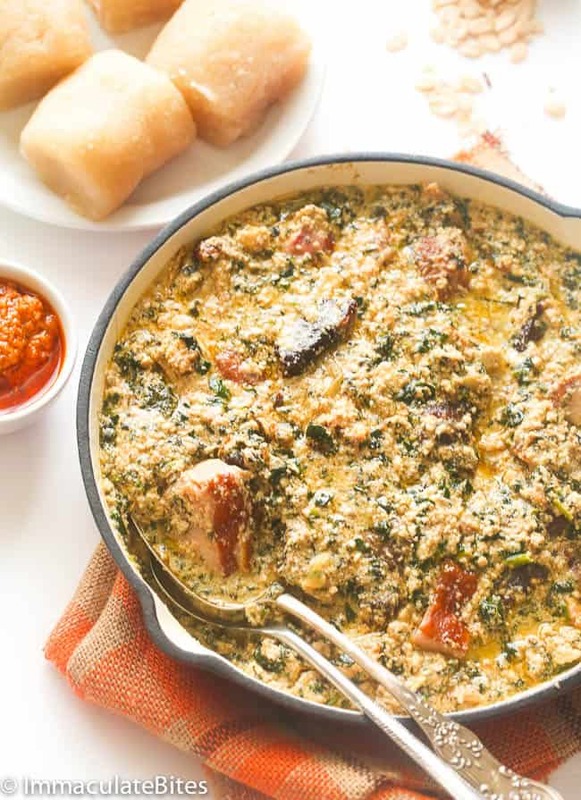 One of my first post entries is about egusi soup- a true West African Classic- widely enjoyed in West African countries like Nigeria, Ghana, Sierra Leone and Cameroon just to name a few with slight to difference in preparation from country to country and even between villages. Technically speaking, it is not a soup- I believe we(Africans) have become so complacent or some would say lazy that every sauce or stew is named soup. One thing that is certain though, this exotic sauce is a POWERHOUSE! -Its nutritional benefits may lure you in but the taste will keep you coming back for more. The other day, you should have seen my excitement when I stumbled upon egusi at an Indian market under the name –charmagaz. I would have sworn these melon seeds are only consumed it Africa. Now I know where to find some when the craving hits and don’t want to make a long drive to an African market. Egusi is a wild member of the gourd family, with very dry skin and bitter flesh. It looks the same as watermelon seeds but taste quite differently. They are extremely nutritious- high in protein and oil. They are often use in West Africa as thickening agent in soups, and add depth to most meals. In Cameroon, it is sometimes use to make Egusi pudding; a highly addictive pudding featured here. If you are looking for a recipe with lumps look here. Use smoked fish or any kind of meat to heart’s desire. You can purchase these seeds in African Markets, Indian markets or online, but if you are in West Africa, they are available in most markets. Store it in the refrigerator and it will stay fresh for more than a year. 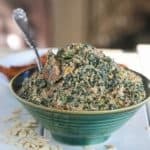 Egusi Soup -- Quick , Easy and Healthier Egusi soup made with lots of spinach. 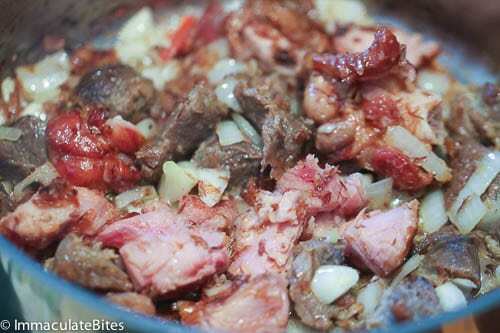 In medium –sized saucepan boil beef seasoned with salt (garlic salt), smoked paprika, pepper, and onions until tender - make sure you have added plenty of water so you have about 3-4 cups of beef stock to use for cooking. Remove the beef and reserve the stock. Serve warm with plantains, eba, yams or accompaniment of choice. Thank you for posting this recipe. I want to try it next week when I visit my boyfriend as he is Nigerian. Will the recipe still taste good if I do not use crawfish? He is allergic to shellfish. Also, how small do I chop the tomatoes? I’m not a good cook so the details matter for me! Because I don’t use the crawfish using beef and turkey sausage (he also doesn’t eat pork) will be fine? And just to clarify I will season the beef pieces and boil them in 2-4 cups of water to make the beef stock…the picture they don’t look like they are being boiled which may or not be a reflection of your directions, but I just want to make sure I do it just as you have done it. Yes you can leave out the crayfish and use smoked turkey and beef only. The tomatoes should be diced(small) . 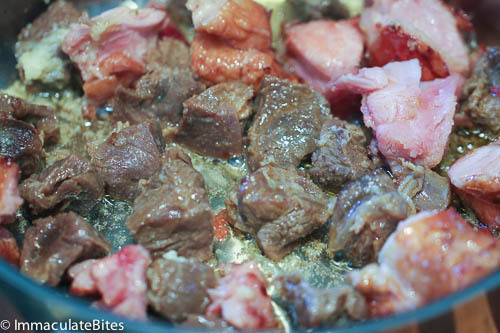 Boil the meat with about 4 cups water . You can’t go wrong with it . Happy Cooking !!!! I’m from Uzbekistan and I’m dating Nigerian guy. 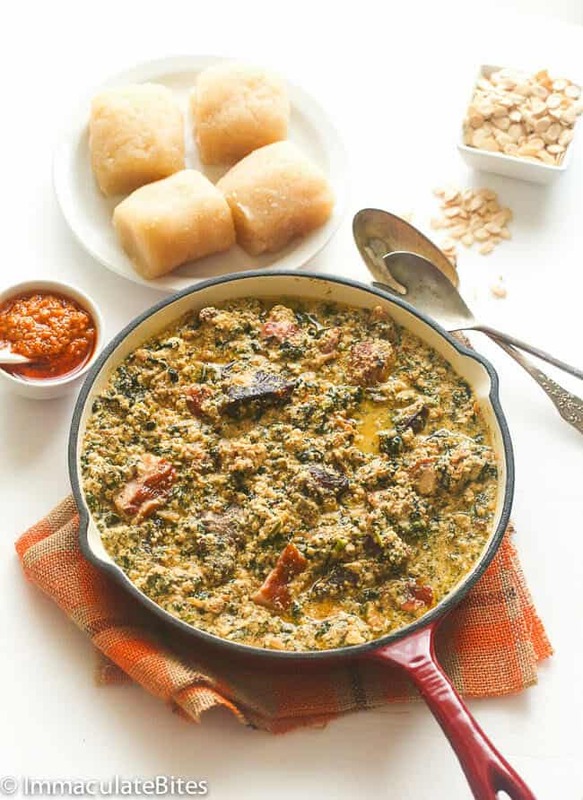 I’ve tried many of their dishes and fall in love with egusi soup and okro soup. 1 day planning to cook it myself. Way to go, Lena! 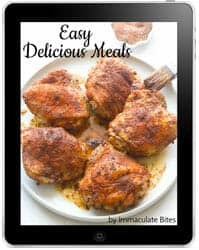 You can find a couple f Nigerian recipes here. Happy cooking! Just made this for my husband & he loved it! Imma thanks for sharing so many great recipes. There a lot of foods I grew up eating but never learned how to make. Definitely will make this again. Awesome! So happy to have been of help. Do let me know how it works out for you. My pleasure! Girl, you are going to just keep nailing it . You’ve got this! I love egusi but did not know how to make it. 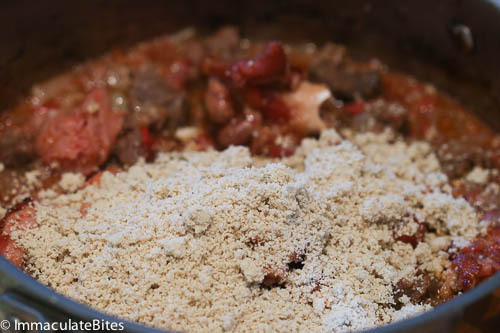 Thank you for this great and easy recipe, I’m making egusi right now. It’s 10:33 pm, so once it’s done I’ll have dinner for tomorrow. But I’m truly going to eat some tonight too. Love this stuff!! Glad you do Priscilla! It’s been a while since I had this. Now I want to make it too! Thanks for taking the time to share your thoughts with me. I made this tonight and it came out great! I love the fact that it wasn’t oily!. Awesome! Not oily at all .Thanks for taking the time to let me know. Awesome! Thanks for letting me know . I absolutely love your recipes! My husband is from Cameroon and this is my go-to website anytime I want to make one of their dishes. Every meal has turned out great! You rock!!!! Keep up the good work Imm! Awesome!Thank you so much!! And so happy you took the time to let me know. Laurence, you better get cooking. We love this soup. Everyone enjoyed it. We love this egusi soup. Everyone enjoyed it. Glad it was a hit Kelsey. Here it is-Beef Suya https://africanbites.com/?p=1846. Will work on that. I can’t believe this is on the Internet. I was wondering. ..can you make a post on how to smoke turkey or fish just like they do in the markets at home? Also, do you have a recipe for soya? I miss it so much and it would be awesome to make it and surprise my family! Hey Immaculate good job-love the variation with garlic. 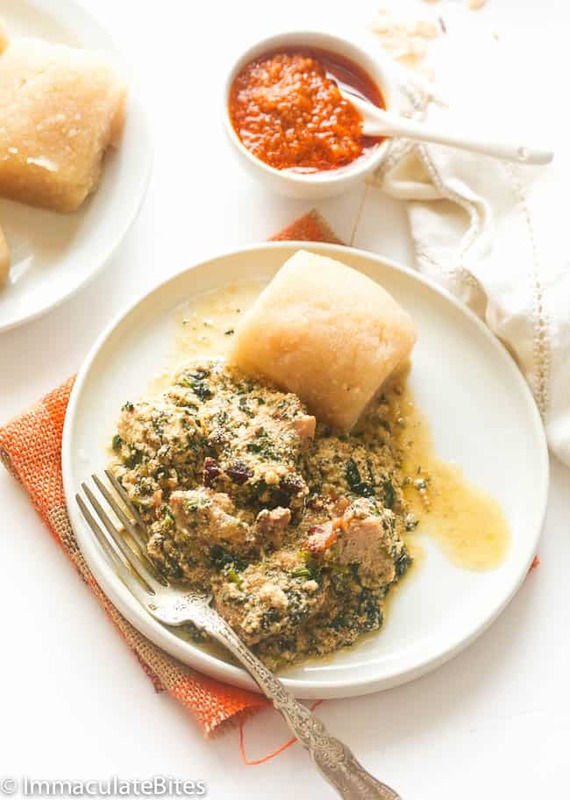 Coming from Cameroon, we use egusi in a myriad of ways and dishes. I know there was a comment/question as to what egusi is. Egusi is simply pumpkin seeds. So definitely very healthy. Hello, I just wanted to thank you so much for your website. 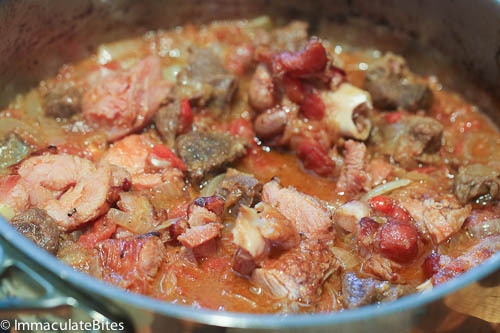 I am a 17 year old, trying to learn to cook all my native Cameroonian dishes and you are such a great help. Just came across your blog and I am loving it! Please continue what you do! Anne, thanks. I am so happy to see a teenager learning to cook Cameroonian dishes- they usually want pizza, fries…. . You are a BRAVE one! Hi Immaculate, i saw this recipe last friday while researching what to cook over the weekend for my family. I decided to try it and lo and behold, what a regal it was. everyone kept asking for a refill. tanx so much for a great recipe and for your relentless effort on this blog. Thanks Yvonne. Really happy it was a hit with your family and so appreciate the feedback! I have never heard of a soup like this before.. you learn something new everyday! Thanks for sharing the great recipe, it looks delicious and definitely something that I am inspired to create as I am curious to know what it tastes like! Thalia, you would be pleasantly surprise. I will do my best , I have some South African desserts am working on already. Hopefully next week if it works out. This looks wonderful Imma, I’m definitely going to try this recipe. 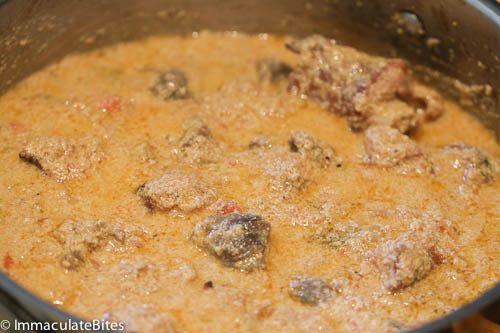 Slightly off the subject but I have a recipe request, could you feature some South African recipes, specifically Botswanan? Yummy!!!!!!! will great time and cook me some egusi soup and fufu for dinner today. Thanks Immaculate. Really shocking!!! 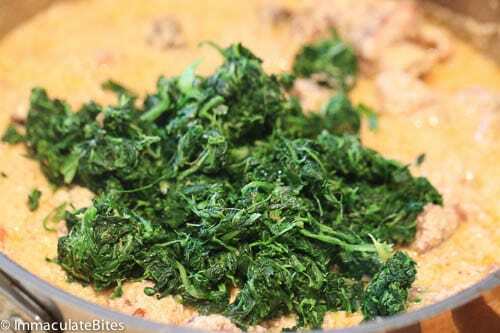 Egusi is a superfood that has not been discovered yet by the western world. Someday it will. Keep an eye for it . Nagi and Immaculate, egusi is just our local name for pumpkin seeds. They’d be found at your local co-op or super market dried.I think near quinoa and other dried proteins. Then, you’d have to grind them. Ijust made egusi soup today with GREEN pumpkin seeds. Quite different to the eye initially but the taste is just the same as the white pumpkin seeds’ method. Egusi is not pumpkin seeds. They are melon seeds. Yummy!! Im glad i finally found the recipe, i love this dish. thanks Immaculate. Can you use another vegetable in place of spinach? Awesome! Any greens works just fine .